At Comic-Con 2008 we were fortunate to meet Victoria Erica of Geek FM Radio, who interviewed me about The Stunt People and what we’re all about. The Geek FM Radio site is dedicated to geek stuff I guess, and we fit that nicely. So have a listen below, and don’t forget to check out their site for more audio-casts of nerds like us. Our interview is about half-way through the recording. A full gallery with captions from Comic-Con 2008 is now up. Check it out here! 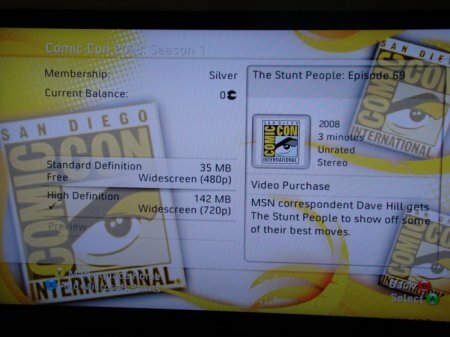 The Stunt People on XBOX LIVE! 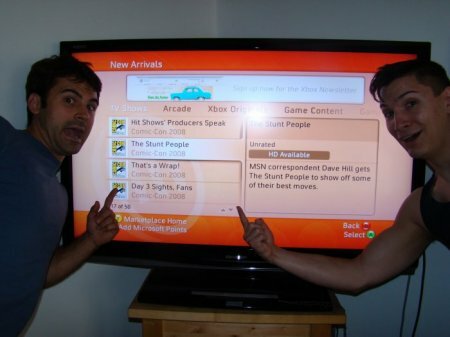 When we returned home, beaten and defeated, from Comic-Con 2008, we were delighted to see we were featured in XBOX Live Marketplace’s video section. If you have an XBOX360, go check it out, or you can just watch the video below. Just be forewarned: we had been standing at our booth for 3 days and suddenly were approached to do an interview and asked to do some stunts without warming up, without any pads, and basically without warning. Howy cwap we hab ow own bwade! Gigi Edgely, David Franklin, Ponch, Tony Todd, Tori Amos, Matt Mullins, Paul Rapovski, and Flitz were all here, and some came to our booth. We sold out of Undercut. On Friday at Comic-con we arrived early to avoid the surprise of early-comers breaking through the doors 30 minutes before the scheduled opening. We were able to wander about and take some photos, and once the flood gates opened we hurried back to the booth again. Business was about as good as Thursday’s. We ended up meeting Zachary Quinto (“Sylar”) from Heroes, Breckin Meyer, Mick Foley, “Flash Gordon” Sam Jones, and Zach Selwyn from Attack of the Show. Thursday was the official “first day” of Comic-con, and it was already insane. The crowd was so thick we could barely get through the front doors to our booth. It was so packed they actually let people in early because the lines outside were getting so huge, and now we know we’re going to have to get to the convention early so we don’t have an empty booth. San Diego Comic-con is upon us! The Stunt People will be exhibiting this year at booth #5419, located on the back wall of the convention at the end of aisle 2000. We’ll have the Indican version of Contour for sale as well as Undercut, Immortal, shirts, bracelets, and posters. And autographs! We hope to see you there! Below is a small map so you can find us.